This week I finished digitising and testing out the 12 designs in Royal Heirloom 4 for mega hoops that are 360mm by 150mm. 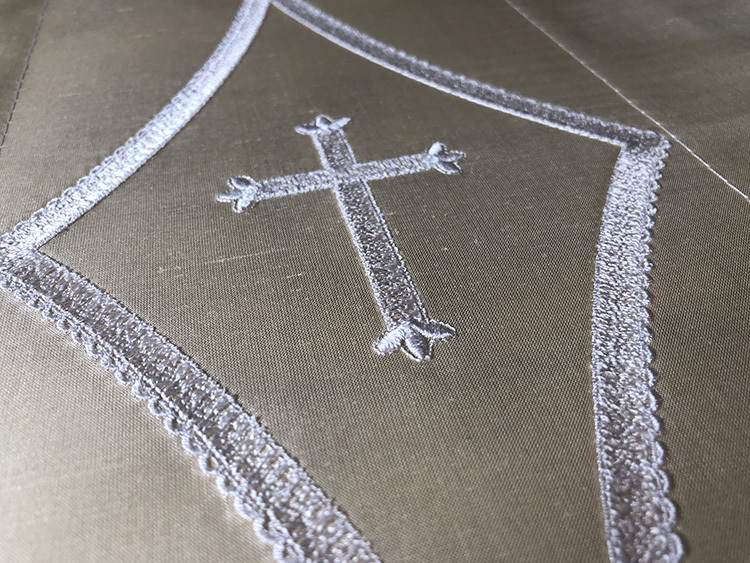 As well as creating designs which can be used individually I like to make sure that the majority of the designs will combine easily for larger areas, like the train of a wedding dress or the front skirt of a Christening down. I have introduced a few new elements in this set of designs too. The first new element which I thought would be beneficial was a lace diamond which can be used alongside other designs. I will be creating a slightly smaller one in the final set for 12″ by 8″ hoops. Here we see GFE-RLH-4-1 with GFE-RLH-3-9 and GFE-RLH-3-11. This is a huge sample embroidery just created to show how they combine so well together. I don’t expect you to embroider this. The other new element is a large scroll which I felt would be invaluable. 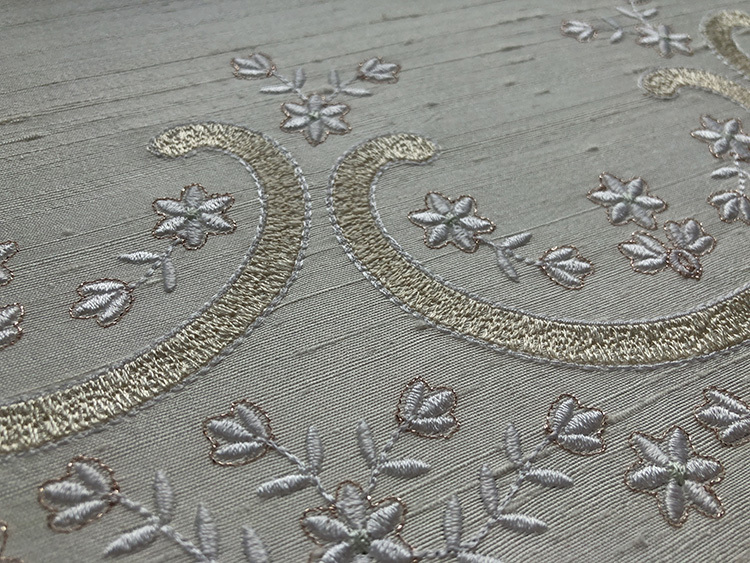 When I tested this design I embroidered it in just white on a pale gold silk dupion. This had been stored for a while and had a nasty crease on it. Although I have heard many a time that it is easy to get the creases out of silk, I disagree. Silk dupion should never get wet, let alone be washed as it leaves water marks. However I gently sprayed the silk before pressing with Mary Ellen’s Best Press, a starch and sizing alternative (available on Amazon). My particular bottle has a wonderful lavender aroma. I confess, as I always do in this blog, that I had the nozzle set on stream instead of spray, so there are slight marks where it got overly wet, but the crease ironed out perfectly. Thank you Pamela for telling me about this wonderful product. Back to my stitch out, and the result. In my opinion, these designs have so much detail, it is a shame because that is lost when they are stitched out in just one colour. However it will work for some projects and it is all down to personal choice. A while back I received an email from Superior Threads where I purchase my Silk thread, advertising a rose gold metallic thread (currently out of stock). I could not resist it, and I used it in this sample instead of Sulky Rayon 1218 Silver Gray. I think it adds a nice subtle shine to the designs. 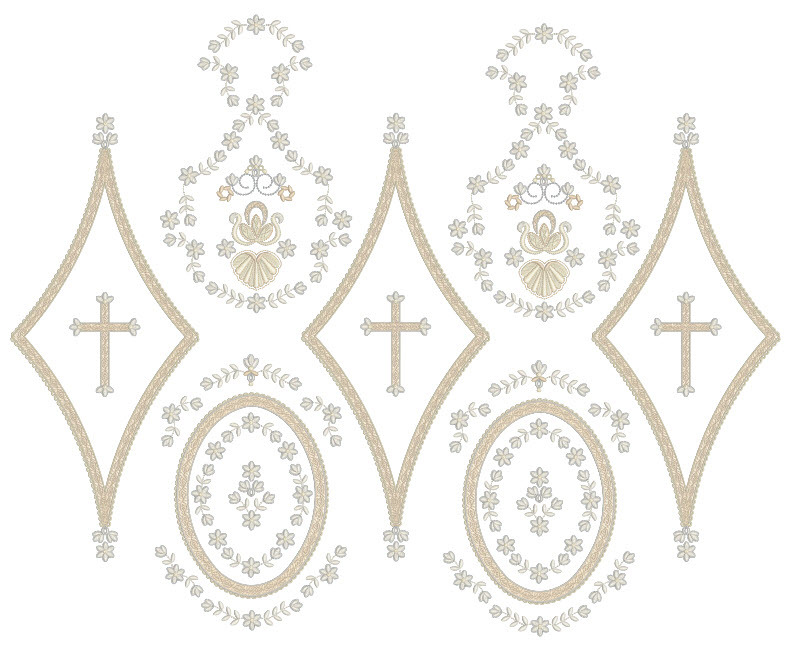 Remember both the cross, scrolls, ovals, diamonds and panels that feature this lace effect can easily be given the shadow work treatment. The last stitch out that I wanted to share with you today was done in a different colour scheme. 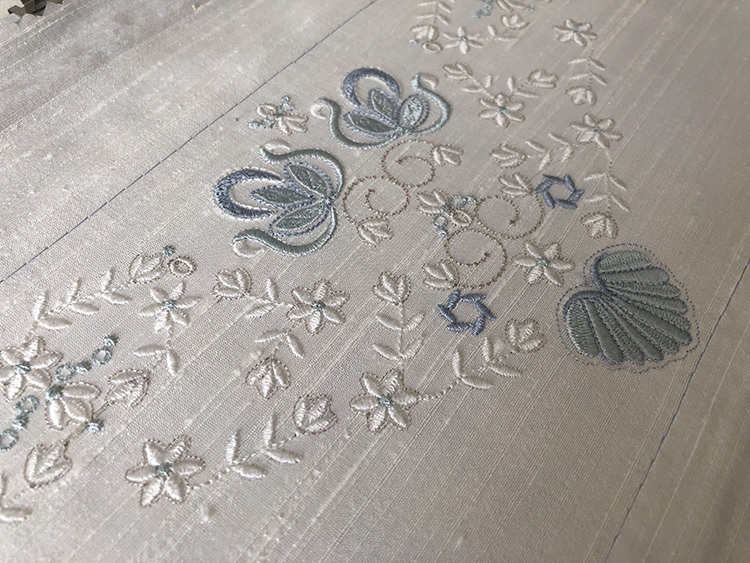 I fancied giving one of the design the Wedge wood look, but found I had no pale blue silk so I stitched this design on white dupion silk and introduced Sulky rayon 1165 Light sky blue and 1151 Powder blue tint. I love the overall effect of this stitch out. Careful changes of thread colours can give a very different look but always be aware that threads look different on different coloured fabric. A light grey will show well on an ivory fabric but if it it stitched out on black fabric it will look like white. Quite a few of the designs in this set will be stitched out horizontally but the final set in the collection for 12″ by 8″ hoops will have designs which can be embroidered above them, making a great combination. Royal Heirloom 4 will be released later today, 8th August, 2018. Watch out for a little video on how I edited the combination of designs above, in my software. 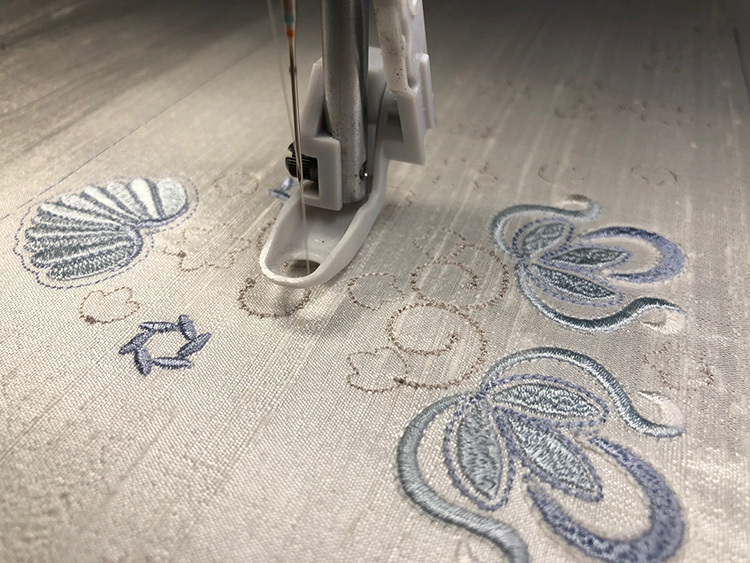 This entry was posted in Discussing machine embroidery, New Designs and tagged colour changes, combining embroidery designs, development of embroidery, embroidery on silk, heirloom embroidery, machine embroidery. Bookmark the permalink. The Wedgewood Blue effect is a gorgeous use of an already stunning set of designs! Hazel. You always give such useful tips and techniques for stitching out your designs that translate to other designs and increase our knowledge of machine embroidery. 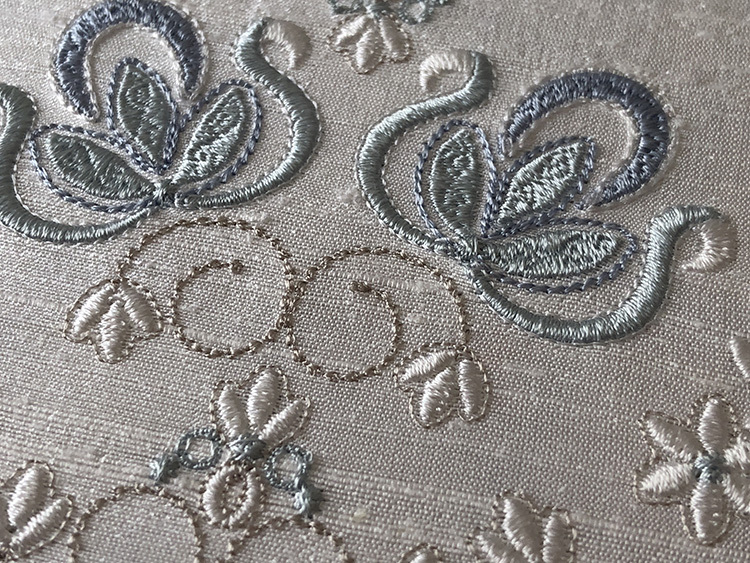 Really appreciate the tips of how a thread color can take on a different color depending on the color of the fabric and how to combine designs to achieve a special design that we can create in our software. I have to agree with Gail B! Your so thorough explaining how,things work that we all get a very good education from you. I love this collection too. Very delicate in its appearance. I also wanted to thank you for including samples,of the designs in different color thread and how they will look depending on the color of fabric we use. I thank you for all your tips and the education we all get! Many hugz! These designs are absolutely gorgeous and your attention to detail is so amazing! I truly love how you describe your designs–you know your designs so well, it’s like you are describing part of your family. I can’t wait to sew these onto a Christening gown! In that case I cannot wait to see the Christening gown. Your work is always so lovely. Thank you for your comment which has been chosen as comment of the week. Check your account for your Rewards. I re read this article today, and I have to say I love the blue and mint colors you used. I was amazed at how different the design turned out. 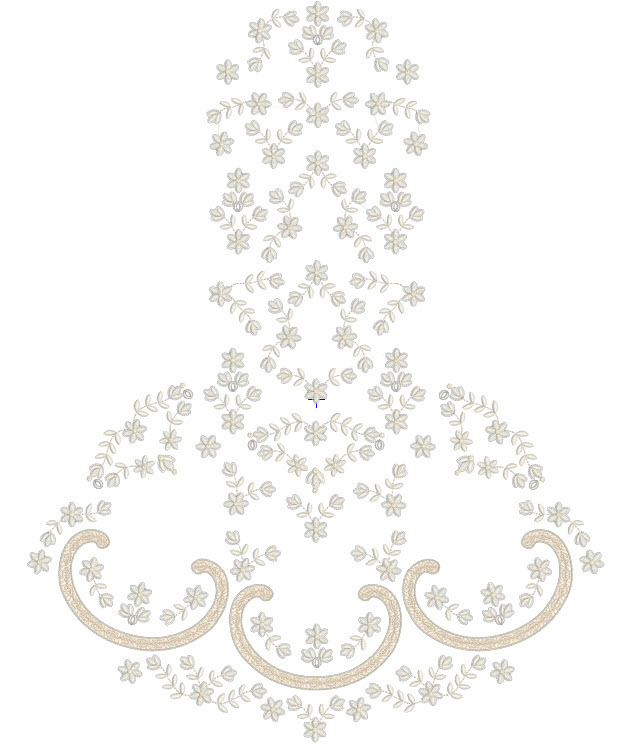 Once again your attention to detail on intricate designs is simply astonishing! Actually on any design you produce has been the same attention to detail. I am so very grateful to be a part of your group and wish I found you years ago!